Skerries v Old Cresent – 08/10/2016. Ulster Bank All Ireland League Div 2B – Holmpatrick 08/10/2016. Skerries: 27 ( David Quirke try 1 pen 2 conv, Eoghan Carron try, Mark Nally try, Chris Tonge try). Saturday’s match was an unlikely prelude to the Leinster V Munster match, the AIL match being delayed to accommodate the Pro 12 game. Leinster took the honours in that showdown. It was perfect afternoon for open rugby and which pitted Skerries against Limerick’s Old Crescent one time Division One contenders. Skerries had a late change in the backline with Barry Caldwell coming in for Colin Doyle, Maurice McAuley starting at 14 for Dara Lowndes and Neil Martin starting in the pack for Eoin O’Byrne otherwise unchanged from the previous game. For the opening ten minutes, both team showed their intent with running the ball and putting together some good phases. With 15 minutes on the clock, Crescent were awarded a penalty which was duly converted by Shane O’Brien. 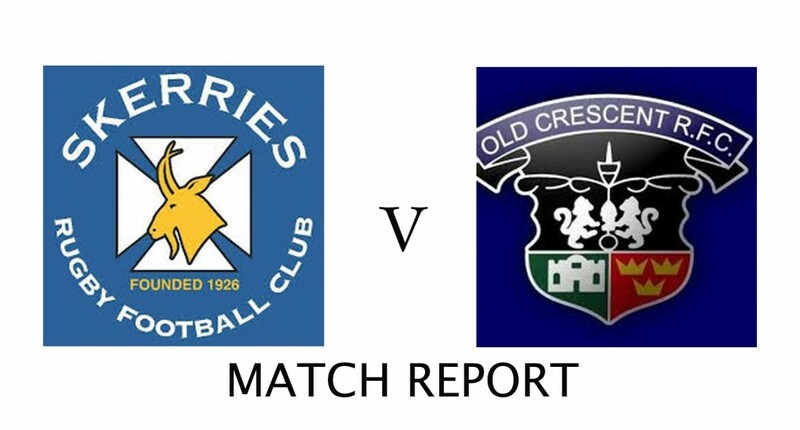 From the restart, Skerries were guilty of some indecision and from the resulting plays, Old Crescent opened with the first try of the match by L Hanley which was duly converted leaving the score ten points to nil. Almost from the restart and after some good play by Crescent’s, Cathal O’Reilly crossed the white wash for another try for Old Crescent making the score 0-17 to the visitors twenty minutes into the game. Skerries regrouped and played some good rugby, with Ross McAuley leading the charge. Skerries had chances to reduce the score but were thwarted by good defence by Crescent coupled with handling mistakes, Skerries could not gain that advantage. With five minutes to go before half time, Skerries were rewarded a penalty which was nicely kicked by David Quirke to give Skerries 3 points on the score board. This score seemed to fire Skerries into action and after some good inter play and pressure, Eoghan Carron scored a try in the corner. Skerries were now 8- Old Crescent 17. The game was on. Skerries came out fighting in the second half good work by the pack laid the foundation for a second try for Skerries scored and converted by David Quirke to leave the score 15-22. Old Crescent continued to stifle Skerries attacks with some good defending. While camped on the Crescent line and a try looking imminent, Crescent stole the ball and launched a 70 meter run up the field. Paul Devitt chasing back to force Crescent to knock on over the line and Skerries escaped which would have been the killer blow. Evan Sherlock was introduced for the injured Tom O’Hare. Skerries were beginning to make more inroads into the Crescent defence. With some good inter plays and offloads between backs and forwards, Skerries got their third try scored by Mark Nally and nicely converted by David Quirke. Skerries were now in the lead with 22 points to 17. Old Crescent regrouped and continued to force the play on Skerries. They were awarded a penalty which was converted by Shane O’Brien. Shortly after they got another penalty which put Old Crescent ahead 23 – 22 with 10 minutes to go. Skerries continued to play intent and good pressure pushed Skerries into the Crescent 22. The resulting maul ending short of the line but Crescent were penalised and received a yellow card for an infringement. From the resulting line out and maul, Chris Tonge went over, the conversion was unsuccessful and left the score 27-30. With three minutes remaining, Skerries continued to get the upper hand and edged their way to the Crescent line. Continued infringement by Crescent led to a penalty under the posts. With 1 player in the bin for Crescent, Skerries went for the win and turned down the chance to draw the game. Skerries pounded the Crescent line but were unable to make that break through. The final play ended in a Crescent turnover and Skerries would end up just short. Another two points gained against a good Crescent side. Even though the team suffered a loss, this was Skerries best performance to date. In the pack, Kieran Leonard, Joe Glennon, Mark Nally, Chris Tonge and the returning Evan Sherlock showed they can be a match for most teams. The Skerries back line continues to grow in confidence after two high scoring games. The AIL league takes a break until the 29th of October when Skerries welcome City of Armagh to Holmpatrick. Skerries Team 1 to 20…. Mark Nally Chris Tonge Neil Martin Joe Glennon Thomas O’Hare Michael Turvey Kieran Leonard Ross McAuley(capt) Eoghan Carron Paul O’Loghlen Ross Dempsey Barry Cauldwell Paul Devitt Maurice McAuley David Quirke Conor Ronayne Evan Sherlock Dara Lowdnes Conn Marrey Ruari Woods.